Over the years I have knit and crocheted many things without taking photos of the finished product – mainly due to the lack of a decent digital camera. I recently bought a new camera (fujifilm finepix F31) and got a Flickr account so I started taking more photos of my work, but since joining Ravelry earlier this week I have made a effort to go round the house photographing some of my old projects (those that haven’t been given away, or lost anyway). It was interesting to see what had survived – mainly scarves, socks, throws, blankets and toys for my daughters – very few items of clothing. A lot of things have signs of wear and are not really fit for a high resolution photo. During my search I discovered these dolls. I knit these for my eldest daughter Carmen about 4 years ago out of oddments of DK yarn I had lying around. The pattern is from an old Interweave knits. They are rather the worse for wear, having lost their hair ribbons and having acquired rather curly limbs, but I still quite like them. 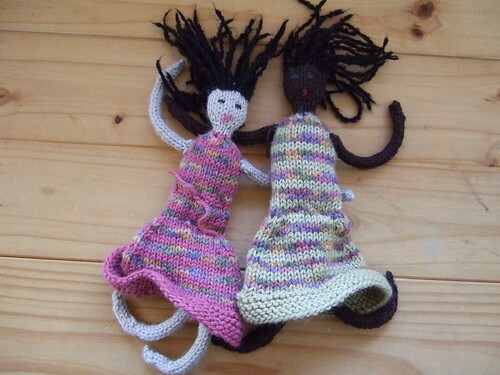 I particularly like the texture of the yarn I used for their hair, ‘though I can’t remember what it is. I might make them some companions one day if I can find the pattern again.